I can never say no to soups. I love them any way they come, chunky, smooth, chilled or nice and hot. 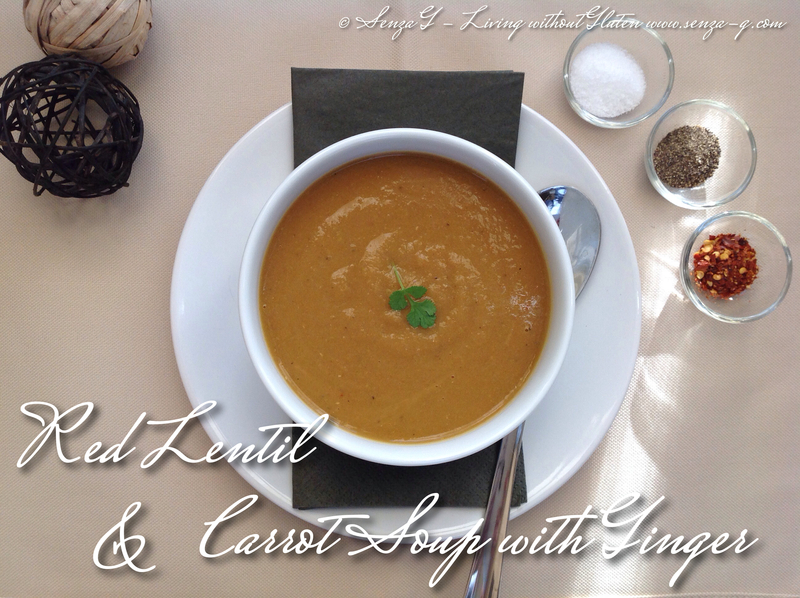 I love both carrot and lentil soup and could not decide on which to make, so I combined both. Added a little ginger, a little turmeric and a little cumin … mmmm, lovely, spicy and warm for a cold winter’s day! Heat the olive oil in a large pot and sauté the onions until translucent. Add the chopped celery and the carrots. Keep cooking for a few minutes and then add the minced garlic and ginger. Add also the spices , stirring and combining them with the vegetables. Throw in the lentils, mixing them in well with the spicy onion mixture. Pour in the vegetable stock, add the tomato paste and season with salt and pepper. Bring to a boil and then leave to simmer for about 30 to 40 minutes or until the lentils are very soft. Blend the soup in a food processor until smooth, adding a little more stock if you do not like it too thick.